T & M Automotive Inc. was established in 1980 in Lancaster, CA. Opening it's doors in the heart of the Antelope Valley, it's vision was to provide safe and reliable service with honest pricing. With the community in mind, T&M did not look only to open it's doors for business-- but to open up a place where everyone felt safe. Many traveled as South as Los Angeles and as North as Bakersfield. The idea of service for neighbors, friends and family has always been beyond what the team at T&M offers or provides, it is what the business does to help contribute to our way of life. For over 38 years T & M Automotive Inc. has serviced the community of the Antelope Valley and it's surrounding communities. 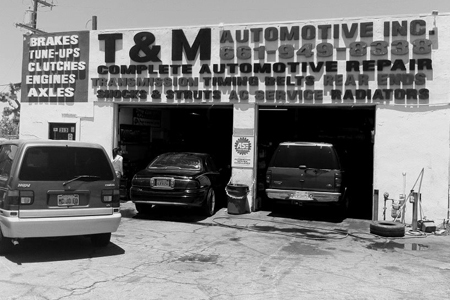 With a trusted reputation for providing reliable general auto repairs, T&M remains dedicated to it's neighbors and welcomes commuters from all over. Servicing both Los Angeles and Kern county motorists, you will find that this is a very special place to meet new friends. "We all have something in common here at T&M.. we are looking to keep moving forward. When I first began so many doubted me, saying that there were too many competitors and that competition was stiff.. they gave me a year before I would be out of business. I tell many now the same as I told them then -- I'm not here to compete, I'm here to serve".